Tuesday, September 11, 2001, dawned temperate and nearly cloudless in the eastern United States. Millions of men and women readied themselves for work. Some made their way to the Twin Towers, the signature structures of the World Trade Center complex in New York City. Others went to Arlington, Virginia, to the Pentagon. Across the Potomac River, the United States Congress was back in session. At the other end of Pennsylvania Avenue, people began to line up for a White House tour. In Sarasota, Florida, President George W. Bush went for an early morning run. For those heading to an airport, weather conditions could not have been better for a safe and pleasant journey. Among the travelers were Mohamed Atta and Abdul Aziz al Omari, who arrived at the airport in Portland, Maine. Atta and Omari arrived in Boston at 6:45. Seven minutes later, Atta apparently took a call from Marwan al Shehhi, a longtime colleague who was at another terminal at Logan Airport. They spoke for three minutes.3 It would be their final conversation. In another Logan terminal, Shehhi, joined by Fayez Banihammad, Mohand al Shehri, Ahmed al Ghamdi, and Hamza al Ghamdi, checked in for United Airlines Flight 175, also bound for Los Angeles. A couple of Shehhi's colleagues were obviously unused to travel; according to the United ticket agent, they had trouble understanding the standard security questions, and she had to go over them slowly until they gave the routine, reassuring answers.5 Their flight was scheduled to depart at 8:00. All five hijackers passed through the Main Terminal's west security screening checkpoint; United Airlines, which was the responsible air carrier, had contracted out the work to Argenbright Security.13 The checkpoint featured closed-circuit television that recorded all passengers, including the hijackers, as they were screened. At 7:18, Mihdhar and Moqed entered the security checkpoint. The 19 men were aboard four transcontinental flights.21 They were planning to hijack these planes and turn them into large guided missiles, loaded with up to 11,400 gallons of jet fuel. By 8:00 A.M. on the morning of Tuesday, September 11, 2001, they had defeated all the security layers that America's civil aviation security system then had in place to prevent a hijacking. At 8:46:40, American 11 crashed into the North Tower of the World Trade Center in New York City.39 All on board, along with an unknown number of people in the tower, were killed instantly. At 9:03:11, United Airlines Flight 175 struck the South Tower of the World Trade Center.51 All on board, along with an unknown number of people in the tower, were killed instantly. At 9:29, the autopilot on American 77 was disengaged; the aircraft was at 7,000 feet and approximately 38 miles west of the Pentagon.59 At 9:32, controllers at the Dulles Terminal Radar Approach Control "observed a primary radar target tracking eastbound at a high rate of speed." This was later determined to have been Flight 77. At 9:37:46, American Airlines Flight 77 crashed into the Pentagon, traveling at approximately 530 miles per hour.61 All on board, as well as many civilian and military personnel in the building, were killed. Several FAA air traffic control officials told us it was the air carriers' responsibility to notify their planes of security problems. One senior FAA air traffic control manager said that it was simply not the FAA's place to order the airlines what to tell their pilots.68 We believe such statements do not reflect an adequate appreciation of the FAA's responsibility for the safety and security of civil aviation. At 9:39, the FAA's Cleveland Air Route Traffic Control Center overheard a second announcement indicating that there was a bomb on board, that the plane was returning to the airport, and that they should remain seated.78 While it apparently was not heard by the passengers, this announcement, like those on Flight 11 and Flight 77, was intended to deceive them. Jarrah, like Atta earlier, may have inadvertently broadcast the message because he did not know how to operate the radio and the intercom. To our knowledge none of them had ever flown an actual airliner before. Jarrah's objective was to crash his airliner into symbols of the American Republic, the Capitol or the White House. He was defeated by the alerted, unarmed passengers of United 93. On 9/11, the defense of U.S. airspace depended on close interaction between two federal agencies: the FAA and the North American Aerospace Defense Command (NORAD).The most recent hijacking that involved U.S. air traffic controllers, FAA management, and military coordination had occurred in 1993.90 In order to understand how the two agencies interacted eight years later, we will review their missions, command and control structures, and working relationship on the morning of 9/11. FAA Control Centers often receive information and make operational decisions independently of one another. On 9/11, the four hijacked aircraft were monitored mainly by the centers in Boston, New York, Cleveland, and Indianapolis. Each center thus had part of the knowledge of what was going on across the system. 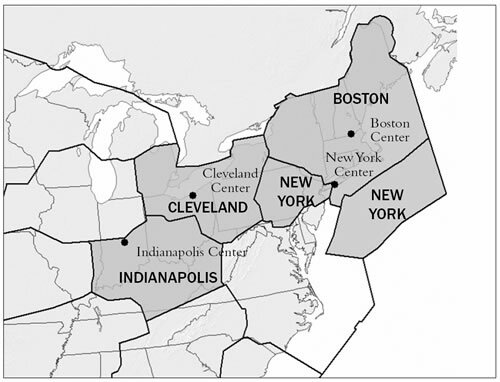 What Boston knew was not necessarily known by centers in New York, Cleveland, or Indianapolis, or for that matter by the Command Center in Herndon or by FAA headquarters in Washington. NORAD perceived the dominant threat to be from cruise missiles. Other threats were identified during the late 1990s, including terrorists' use of aircraft as weapons. Exercises were conducted to counter this threat, but they were not based on actual intelligence. In most instances, the main concern was the use of such aircraft to deliver weapons of mass destruction. 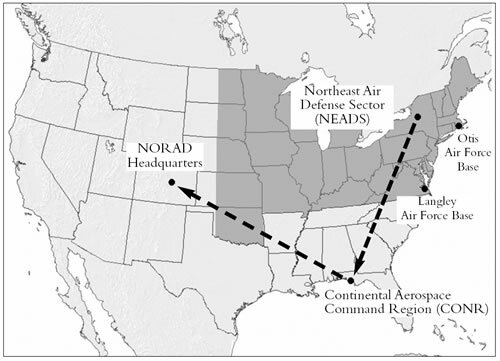 In the United States, NORAD is divided into three sectors. On 9/11, all the hijacked aircraft were in NORAD's Northeast Air Defense Sector (also known as NEADS), which is based in Rome, New York. That morning NEADS could call on two alert sites, each with one pair of ready fighters: Otis Air National Guard Base in Cape Cod, Massachusetts, and Langley Air Force Base in Hampton, Virginia.100 Other facilities, not on "alert," would need time to arm the fighters and organize crews. NEADS reported to the Continental U.S. NORAD Region (CONR) headquarters, in Panama City, Florida, which in turn reported to NORAD headquarters, in Colorado Springs, Colorado. hijacking would take the traditional form: that is, it would not be a suicide hijacking designed to convert the aircraft into a guided missile. On the morning of 9/11, the existing protocol was unsuited in every respect for what was about to happen. American 11: We have some planes. Just stay quiet, and you'll be okay. We are returning to the airport. Between 8:25 and 8:32, in accordance with the FAA protocol, Boston Center managers started notifying their chain of command that American 11 had been hijacked. At 8:28, Boston Center called the Command Center in Herndon to advise that it believed American 11 had been hijacked and was heading toward New York Center's airspace. UAL 175: New York UAL 175 heavy. FAA: UAL 175 go ahead. UAL 175:Yeah.We figured we'd wait to go to your center.Ah, we hearda suspicious transmission on our departure out of Boston, ah, with someone, ah, it sounded like someone keyed the mikes and said ah everyone ah stay in your seats. The New York Center controller and manager were unaware that American 11 had already crashed. The "other aircraft" referred to by New York Center was United 175. Evidence indicates that this conversation was the only notice received by either FAA headquarters or the Herndon Command Center prior to the second crash that there had been a second hijacking. While the Command Center was told about this "other aircraft" at 9:01, New York Center contacted New York terminal approach control and asked for help in locating United 175. Terminal: I got somebody who keeps coasting but it looks like he's going into one of the small airports down there. Center: Hold on a second. I'm trying to bring him up here and get you-There he is right there. Hold on. Terminal: Got him just out of 9,500-9,000 now. Center: Do you know who he is? Terminal: We're just, we just we don't know who he is.We're just picking him up now. Boston Center: Hey . . . you still there? New England Region:Yes, I am. Boston Center: . . . as far as the tape, Bobby seemed to think the guy said that "we have planes." Now, I don't know if it was because it was the accent, or if there's more than one, but I'm gonna, I'm gonna reconfirm that for you, and I'll get back to you real quick. Okay? New England Region: Appreciate it. Unidentified Female Voice: They have what? Boston Center: Planes, as in plural. Boston Center: It sounds like, we're talking to New York, that there's another one aimed at the World Trade Center. New England Region: There's another aircraft? Boston Center: A second one just hit the Trade Center. Because the Otis fighters had expended a great deal of fuel in flying first to military airspace and then to New York, the battle commanders were concerned about refueling. NEADS considered scrambling alert fighters from Langley Air Force Base in Virginia to New York, to provide backup. The Langley fighters were placed on battle stations at 9:09.137 NORAD had no indication that any other plane had been hijacked. Military Notification and Response. NORAD heard nothing about the search for American 77. Instead, the NEADS air defenders heard renewed reports about a plane that no longer existed: American 11. FAA: Military, Boston Center. I just had a report that American 11 is still in the air, and it's on its way towards-heading towards Washington. NEADS: Okay. American 11 is still in the air? NEADS: On its way towards Washington? FAA: That was another-it was evidently another aircraft that hit the tower. That's the latest report we have. FAA: I'm going to try to confirm an ID for you, but I would assume he's somewhere over, uh, either New Jersey or somewhere further south. NEADS: Okay. So American 11 isn't the hijack at all then, right? FAA: No, he is a hijack. NEADS: He-American 11 is a hijack? NEADS: And he's heading into Washington? The mention of a "third aircraft" was not a reference to American 77.There was confusion at that moment in the FAA. Two planes had struck the World Trade Center, and Boston Center had heard from FAA headquarters in Washington that American 11 was still airborne. We have been unable to identify the source of this mistaken FAA information. At the suggestion of the Boston Center's military liaison, NEADS contacted the FAA's Washington Center to ask about American 11. In the course of the conversation, a Washington Center manager informed NEADS: "We're looking-we also lost American 77. "The time was 9:34.151This was the first notice to the military that American 77 was missing, and it had come by chance. If NEADS had not placed that call, the NEADS air defenders would have received no information whatsoever that the flight was even missing, although the FAA had been searching for it. No one at FAA headquarters ever asked for military assistance with American 77. NEADS never lost track of Delta 1989, and even ordered fighter aircraft from Ohio and Michigan to intercept it. The flight never turned off its transponder. NEADS soon learned that the aircraft was not hijacked, and tracked Delta 1989 as it reversed course over Toledo, headed east, and landed in Cleveland.156 But another aircraft was heading toward Washington, an aircraft about which NORAD had heard nothing: United 93. Between 9:34 and 9:38, the Cleveland controller observed United 93 climbing to 40,700 feet and immediately moved several aircraft out its way. The controller continued to try to contact United 93, and asked whether the pilot could confirm that he had been hijacked.162 There was no response. Ziad Jarrah: Uh, this is the captain. Would like you all to remain seated. There is a bomb on board and are going back to the airport, and to have our demands [unintelligible]. Please remain quiet. At 9:46 the Command Center updated FAA headquarters that United 93 was now "twenty-nine minutes out of Washington, D.C."
FAA Headquarters: They're pulling Jeff away to go talk about United 93. Command Center: Uh, that's a decision somebody's gonna have to make probably in the next ten minutes. Command Center: O.K. Uh, there is now on that United 93. Command Center: There is a report of black smoke in the last position I gave you, fifteen miles south of Johnstown. FAA Headquarters: From the airplane or from the ground? Command Center: Uh, they're speculating it's from the aircraft. Despite the discussions about military assistance, no one from FAA headquarters requested military assistance regarding United 93. Nor did any manager at FAA headquarters pass any of the information it had about United 93 to the military. NEADS: I also want to give you a heads-up, Washington. NEADS: United nine three, have you got information on that yet? FAA: He did not land. NEADS: Oh, he's down? Down? FAA: Yes. Somewhere up northeast of Camp David. NEADS: Northeast of Camp David. The time of notification of the crash of United 93 was 10:15.174 The NEADS air defenders never located the flight or followed it on their radar scopes. The flight had already crashed by the time they learned it was hijacked. The defense of U.S. airspace on 9/11 was not conducted in accord with preexisting training and protocols. It was improvised by civilians who had never handled a hijacked aircraft that attempted to disappear, and by a military unprepared for the transformation of commercial aircraft into weapons of mass destruction. As it turned out, the NEADS air defenders had nine minutes' notice on the first hijacked plane, no advance notice on the second, no advance notice on the third, and no advance notice on the fourth. We do not believe that the true picture of that morning reflects discredit on the operational personnel at NEADS or FAA facilities. NEADS commanders and officers actively sought out information, and made the best judgments they could on the basis of what they knew. Individual FAA controllers, facility managers, and Command Center managers thought outside the box in recommending a nationwide alert, in ground-stopping local traffic, and, ultimately, in deciding to land all aircraft and executing that unprecedented order flawlessly. More than the actual events, inaccurate government accounts of those events made it appear that the military was notified in time to respond to two of the hijackings, raising questions about the adequacy of the response. Those accounts had the effect of deflecting questions about the military's capacity to obtain timely and accurate information from its own sources. In addition, they overstated the FAA's ability to provide the military with timely and useful information that morning. In public testimony before this Commission in May 2003, NORAD officials stated that at 9:16, NEADS received hijack notification of United 93 from the FAA.175This statement was incorrect. There was no hijack to report at 9:16. United 93 was proceeding normally at that time. In their testimony and in other public accounts, NORAD officials also stated that the Langley fighters were scrambled to respond to the notifications about American 77,178 United 93, or both. These statements were incorrect as well. The fighters were scrambled because of the report that American 11 was heading south, as is clear not just from taped conversations at NEADS but also from taped conversations at FAA centers; contemporaneous logs compiled at NEADS, Continental Region headquarters, and NORAD; and other records. Yet this response to a phantom aircraft was not recounted in a single public timeline or statement issued by the FAA or Department of Defense. The inaccurate accounts created the impression that the Langley scramble was a logical response to an actual hijacked aircraft. In fact, not only was the scramble prompted by the mistaken information about American 11, but NEADS never received notice that American 77 was hijacked. It was notified at 9:34 that American 77 was lost. Then, minutes later, NEADS was told that an unknown plane was 6 miles southwest of the White House. Only then did the already scrambled airplanes start moving directly toward Washington, D.C. Thus the military did not have 14 minutes to respond to American 77, as testimony to the Commission in May 2003 suggested. It had at most one or two minutes to react to the unidentified plane approaching Washington, and the fighters were in the wrong place to be able to help. They had been responding to a report about an aircraft that did not exist. Nor did the military have 47 minutes to respond to United 93, as would be implied by the account that it received notice of the flight's hijacking at 9:16. By the time the military learned about the flight, it had crashed. We now turn to the role of national leadership in the events that morning. Most federal agencies learned about the crash in New York from CNN.180 Within the FAA, the administrator, Jane Garvey, and her acting deputy, Monte Belger, had not been told of a confirmed hijacking before they learned from television that a plane had crashed.181 Others in the agency were aware of it, as we explained earlier in this chapter. The FAA and White House Teleconferences. The FAA, the White House, and the Defense Department each initiated a multiagency teleconference before 9:30. Because none of these teleconferences-at least before 10:00- included the right officials from both the FAA and Defense Department, none succeeded in meaningfully coordinating the military and FAA response to the hijackings. * All times given for this conference call are estimates, which we and the Department of Defense believe to be accurate within a ± 3 minute margin of error. Floor Leadership: You need to read this.. . .The Region Commander has declared that we can shoot down aircraft that do not respond to our direction. Copy that? Controllers: DO [Director of Operations] is saying no. Floor Leadership: No? It came over the chat.. . .You got a conflict on that direction? In interviews with us, NEADS personnel expressed considerable confusion over the nature and effect of the order. Vice President: There's been at least three instances here where we've had reports of aircraft approaching Washington-a couple were confirmed hijack. And, pursuant to the President's instructions I gave authorization for them to be taken out. Hello? SecDef: Yes, I understand. Who did you give that direction to? Vice President: It was passed from here through the [operations] center at the White House, from the [shelter]. SecDef: OK, let me ask the question here. Has that directive been transmitted to the aircraft? Vice President: Yes, it has. SecDef: So we've got a couple of aircraft up there that have those instructions at this present time? Vice President: That is correct. And it's my understanding they've already taken a couple of aircraft out. Thus, while the fighter pilots under NORAD direction who had scrambled out of Langley never received any type of engagement order, the Andrews pilots were operating weapons free-a permissive rule of engagement. The President and the Vice President indicated to us they had not been aware that fighters had been scrambled out of Andrews, at the request of the Secret Service and outside the military chain of command.237 There is no evidence that NORAD headquarters or military officials in the NMCC knew-during the morning of September 11-that the Andrews planes were airborne and operating under different rules of engagement. NORAD officials have maintained consistently that had the passengers not caused United 93 to crash, the military would have prevented it from reaching Washington, D.C. That conclusion is based on a version of events that we now know is incorrect. The Langley fighters were not scrambled in response to United 93; NORAD did not have 47 minutes to intercept the flight; NORAD did not even know the plane was hijacked until after it had crashed. It is appropriate, therefore, to reconsider whether United 93 would have been intercepted. At that point in time, the Langley pilots did not know the threat they were facing, did not know where United 93 was located, and did not have shoot-down authorization. Second, NEADS did not have accurate information on the location of United 93. Presumably FAA would have provided such information, but we do not know how long that would have taken, nor how long it would have taken NEADS to locate the target. NORAD officials have maintained that they would have intercepted and shot down United 93.We are not so sure. We are sure that the nation owes a debt to the passengers of United 93.Their actions saved the lives of countless others, and may have saved either the Capitol or the White House from destruction. The details of what happened on the morning of September 11 are complex, but they play out a simple theme. NORAD and the FAA were unprepared for the type of attacks launched against the United States on September 11, 2001.They struggled, under difficult circumstances, to improvise a homeland defense against an unprecedented challenge they had never before encountered and had never trained to meet. He was, and is, right. But the conflict did not begin on 9/11. It had been publicly declared years earlier, most notably in a declaration faxed early in 1998 to an Arabic-language newspaper in London. Few Americans had noticed it. The fax had been sent from thousands of miles away by the followers of a Saudi exile gathered in one of the most remote and impoverished countries on earth.